Vastu for Skewed; (Tilted, Vidisha, Non-Diagonal, Inclination, Dikmud, Bend, direction-less, Uneven sites, Non-directional ) Corners | Plots | Houses | Sites | Home | Properties: Vastu for Skewed Plots or Non-aligned or twisted out of shape, bent, this is a toughest subject, now we are discussing on this subject. How to find the property whether it is inclined or tilted, in this link we discuss about such information, it is little difficult to explain, but we tried hard to explain with images, trust you may understood after reading this link, if any inconvenience here to understand then please inform us, we will definitely take care and rewrite the content or publish the new images. Your one minute may help our society, please email the problems in this section, thanks in advance. Most of the visitors expressing their gratitude by seeing our efforts here to explain this subject in easy language and images. You are aware that there are only 4 directions like East, West, North and South and there are 4 corners namely Northeast, Southeast, Northwest, Southwest corners. These are also called as "non directional", "skewed", "cornered", "Inclined", "irregular shaped", "Vidisha", "Tilted", "Bent", "Bend", "Vidikku", "Dikmud" or "Dikmood", "dikdosh" properties. Anyway Expert Vastu Pandit knows all about this inclined Plots information, we cannot say he is Vastu Shastra expert if he does not know about skewed plots. Observe these below images: For best understanding purpose we published few images one after another with appropriate description. This is a simple directional property or directions. All are seems to be right here and exact places. Please note one point before reading this articles. The directions never changes or never turns, its impossible. Only the properties or land is not marked according to the directions. Some times it is not possible to align according to the directions. If a builder has one acre of land, then how he build all lots or Homes according to the Directions, if he done like that, he may loose maximum percentage of land only for this directional purposes. This image shows the corner names not the directions. Please observe that only the corners are shown in a House property. Carefully observe all the images, most of the images are seems to be same but found the difference if we see it careflly. Here we can observe the directions and corners. Total 8. The 8 directions (4 directions and 4 corners) are shown in a house property. Now you can easily identify the directions and corners in a house here. This images helps you how to find out the directions and corners on a property - House. Seems to be the above image and this image are same, please observe the changes here. Don't read the below para, first observe the image and check the above one. Now the directions changed (Please note that directions never changed, for more info read at first para for more info on this subject). East is not in East area, it has changed to northeast corner. Almost this image is also same as above images, but East has changed to Southeast cornered area. Like wise the properties are situated in several areas. In these types of properties, buyers are strictly advised not to go directly without Vastu Expert opinion on such properties. In this image, we are observing only a house and background the directions and corners are slightly shown. Here the directions and corners are clearly shown with full names of such directions. This image helps you lot in finding the corners or directions of a property. Now we are discussing on the roads and properties which have directions or corners. Some body simply says that their property is northeast corner one, before saying that they must observe whether their property is according to this type or not. Now coming to the point the road is northeast road. Generally we may not find out these types of properties in all cities or towns, but particularly in some cities or towns the Sites are like this only. For example in Delhi you can find large number of (www.SubhaVaastu.com) properties. Next time when ever you may visit Delhi, please observe these skewed properties. If any body is planning to buy these type of properties he/she must shown the property to one Expert Vastu Pandit, otherwise he may not stand as a winner. Be cautious before buying these types of plots or houses. Before buying these types of plots or houses, check the dimensions to have good future. If the dimensions (measurements) are correct according to skewed Vaastu shastra then you may buy otherwise don't go for register them. Before taking any decision it is better to have experts advise. This property is called Southeast road property. Road is towards Southeast corner side. Be cautious before buying these types of plots or houses. Before buying these types of plots or houses, check the dimensions to have good future. If the dimensions (measurements) are correct according to skewed Vasthu shastra then you may buy otherwise don't go for register them. Before taking any decision it is better to have expert Vaasthu consultant advise and then only take the decision. This property is called Southwest road property. Road is towards Southwest corner side. Be cautious before buying these types of plots or houses. In all types of skewed plots, residents are advised to check the measurements, the northeast and southwest measures may be more than southeast and Northwest measures. This property is called Northwest road property. Road is towards Northwest corner side. Be cautious before buying these types of plots or houses. Now we are observing a house within the skewed land area. These below images helps you how to find the skewed properties at your interested land. By reading this you may know some thing more information on skewed properties and may take the decision on your purchases. We strongly request you before going to buy the properties, it is always better to show it with one expert vastu consultant for secured future. This website is providing only information on Vastu Shastra. Human errors may occurs in our narration, images etc. There may be Corrections required for this page, so consult an expert vastu pandit and decide on your purchases. This is a site which has 90°, the "X" axis and "Y" axis are at right places. Now we marked the "X" axis as North Direction and "Y" axis as the East Direction. Here the degrees are remain same, no changes. Now check the angle and degrees. The site has tilted, and its called as skewed one. Background the axis lines have not changed. They remain same and Directions never changes. Observe the East and North directions here. They never changed, at any time. This image is same as above, only change appeared here is we changed the directions East and North for your understanding purpose only. Pleas note that directions never change. This is only for your understanding purpose. This site tilted to 45°. This site tilted to 135°. For your convenience again we changed the directions for your understanding purpose. Now take a house or property and we will compare with changed or tilted degrees positions. The house is in perfect fitting and it has exactly 90°. For this property is has perfect East and North points (again remember that directions never changed). Check the axis points here. Now the property has changed here for your convenience purpose. At background the directions have not changes, please check the background, the East and North directions are remain same, only site or house has tilted. It happens due to road wrong formations. This site turns to 135°. This site is called as Southeast property or house. Road is towards southeast corner (direction). This site turns to 45°. At background the directions are remain same, (you are well aware that directions never change), this is tilted or skewed property. This property is called as Northeast corner or Northeast direction property. Now this is a gif file which shows you the house or property skewed towards northeast or southeast sides (directions or corners.) Please wait here for 5 seconds and observe the image changes here. This moving image is for your understanding purpose. The degrees shown here is almost approximately. Generally now the residents are showing their properties to Vaastu Consultants, before showing properties, it is better to check Vasthu consultants knowledge. If your consultant is intelligent and knowledge gentlemen, he can catch all issues in your interested property and will guide you accordingly. Don't approach quacks in the market, they may be cheap and due to their wrong guidance you may loose several benefits in the future. Be cautious before selecting your vaasthu consultant. How to check directions in a house without compass? I am always getting only failures, how to stop this nonsense? I am in need of Money, how to earn money with Vastu Shastra Help? What is "T" shaped plot, would like to know some thing on this T shaped sites? Who is your team, I have more interested to know this vastu website entire team? We belongs to a royal family, but always quarrels and disputes are common, how to solve? Which part of the house is best suitable for the trees plantation, which parts has to be omitted? Please see that we have two roads for our house, tell me which door is good and which door is bad? My cousin downloaded one Gruhalakshmi photo image from your website, which link serves the same? What ever I touch, it went wrong and losses in business, how to develop my business with vaastu help? 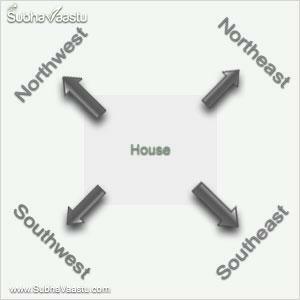 We planned to start house construction, what are the things we keep in mind in terms of Vastu Shastra? Our flat is diagonal. Master bedroom is in east corner. Toilet in NE side. Main entrance in centre os SW side. I have a plot for residential purpose having two sided road, in East direction and south direction. 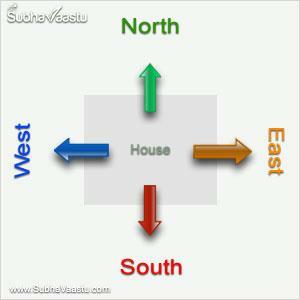 According to vastu shastra whether it is suitable or not? What is the minimum tielt of the flat. I have bought a closed motel in Montgomery , Alabama. this motel have two road on south and west side. Both road have two two entrances. On west side one entrance is on west north corner and second one is about 100ft from south. On south side one entrance is on the corner of south west corner and second is about 110 ft from east side. At present both west and one southwest corner entrance are closed. On west side I want to construct one new entrance .Please kindly advice . We are planning to construct a new house. The lot is facing mostly towards west but is little bit tilted towards south. About 27-30 degrees towards south. Is this a good lot? Please kindly advice.